After a slight delay we finally get to the third part of the programming language job trends. Today we review Erlang, Groovy, Scala, Lisp, and Clojure. If you do not see some of the more popular languages, take a look at Part 1 and Part 2. Lisp is included almost as a baseline, because it has had sustained usage for decades but never enough to get into the mainstream. Go and Haskell are still not included due to the noise in the data and the current lack of demand. Most likely, Go will be included in the next update assuming I can craft a good query for it. If there is an emerging language that you think should be included, please let me know in the comments. Much like the previous two parts of this series, there is a definite downward trend for this group of languages. The trend is not nearly as negative as the previous two posts, but it is there. Groovy demand seems to be a bit cyclical, with new peaks every few months, and it still leads this pack. Scala has followed the same general trend as Groovy and keeping a large lead on the rest of the pack. Clojure has stayed fairly flat for the past two years and that allowed it to take a lead over Erlang. Erlang has slowly declined since its peak in early 2011, barely maintaining a lead over Lisp. Lisp is in a very slow decline over the past 4 years. As you can see, SimplyHired is showing similar downward trends to Indeed for Groovy and Scala. 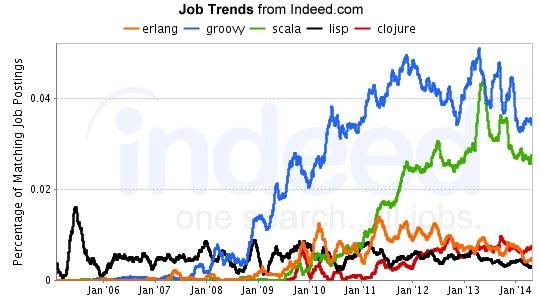 However, the Clojure, Erlang and Lisp trends look much flatter. Clojure has been leading Erlang and Lisp since the middle of 2013 and looks to be increasing its lead while the others decline. Here, Lisp is in a flatter trend which lets it overtake Erlang in the past few months. Erlang seems to be in a bit of a lull after a slight rise at the beginning of 2014. Groovy maintains a very high growth trend, but it is definitely lessening in 2014. Scala is showing very strong growth at just over 10,000% and being somewhat flat overall since late 2011. Much like the other graphs, Clojure growth is outpacing Erlang, sitting above 5000%. Erlang growth is on a negative trend, falling below 500% for the first time since early 2011. Lisp is basically not registering on this graph as it is not really growing, staying barely positive. While most of these languages continue to grow, the trends for Erlang are not a good thing. Steadily decreasing growth for the past 3 years points to a language that will eventually become niche. Given that the overall demand was never that high, future prospects for Erlang are unpleasant. Overall, these trends and the previous two installments make industry growth look flat. Granted, much of this is due to the breadth of languages being used, but even emerging languages are not seeing the same type of increasing growth. If you look at languages like Go and Haskell, the trends are not that much better. Go is definitely growing but Haskell is not. It is possible that both of these languages get included in our next update. 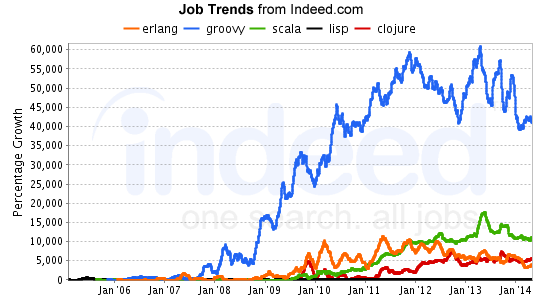 Clojure growth is definitely interesting as it seems to be one of the few positive trends in all of the job trends. I would not be surprised if Clojure starts separating itself from the bottom pack before the next update.